Every now and again we have to say goodbye to some of our animals on Thanda. Not because we want to, but because we have to in order to manage the reserve properly. Currently we have two beautiful, two and half-year old male Lions. They have decided to join up with their mom and her two new cubs. In order to prevent inbreeding and fighting with the much bigger older males, we will have to move them to a new home. 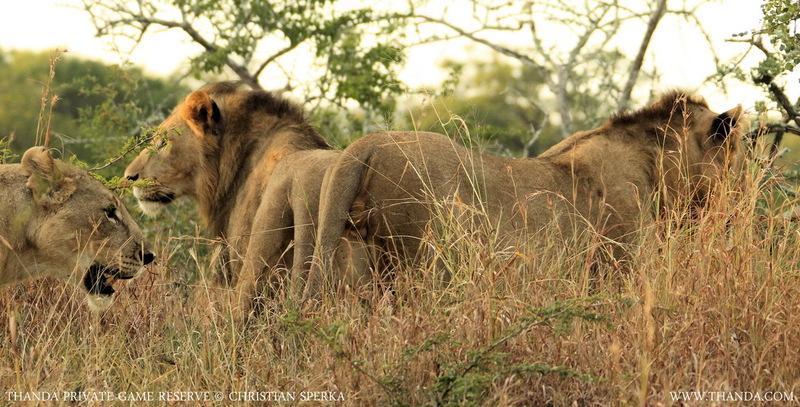 A game reserve nearby, whose male lion was caught in a snare, is looking for a replacement. A good match! Well that was the easy part… Unfortunately you don’t just walk up to a lion and ask him to please climb into the vehicle for a ride to his new home. So we bought 2 HUGE speakers and an amplifier which we will take out into the bush and use it to play the sound of a distressed animal from a recording, which should attract these two elusive boys. We will have bait tied to a tree to make it irresistible for them to stick around. This way the vet can dart them once they start eating. Sounds like fun, right? Well attempt number one brought us a Hyena after playing “distress sounds” for three hours and we eventually decided to pack up for the day. So this is what we’re going to do for many nights so to catch these lions for their big move. Wish us luck! The image above on the left shows John and Mariana from Thanda Wildlife Operations “playing to the Lions”. The image above on the right shows one of two young males. Hello Wendy – We will keep you updated – thanks for the comment.